Pawformance is a syndicate prefix, co-owned between Shell, based in Sydney, NSW and Nik, based in Newcastle, NSW, Australia. We are both heavily involved in dog sports and spend most of our nights and weekends training for, and competing in a variety of disciplines. Our dogs are first and foremost important members of our families, enjoying their (rather cushy) life, sleeping on beds, being fluffy shadows and generally just getting underfoot around the house. We wouldn’t have it any other way! Shell has loved dogs for as long as she can remember; a trait that runs in her family. Her great grandfather bred Afghans and since then, her family and extended family have owned Dobermans. Though time and circumstance meant Shell spent a long time without a dog in her life, Zero came bursting into her life in 2007, a 43kg rescued, fluffy, powerhouse of problems. Though she didn’t know it at the time, Zero had come from a bad situation, not having been socialised or neutralised to the big world around him. Because of this, every time he saw (or thought he saw) another dog, he would become a snarling, lunging, rage beast. Shell sends her heartfelt thanks to Steve Courtney from K9 Pro for his rehabilitation program, which turned Z around. Since then, Zero and Shell haven’t looked back, eventually making their way to an obedience club and beyond. Nik has also loved dogs since she was a young child and has vivid memories of staying up late studying her dog encyclopedia and reading about different breeds. At the age of 11 she was lucky enough to get her first dog, a beagle named Toby. In 2008, a few years after Toby’s passing, she was in a position to welcome another dog into her life. After much consideration of which breed to get, Nik stumbled across Keeshonden and instantly fell in love! 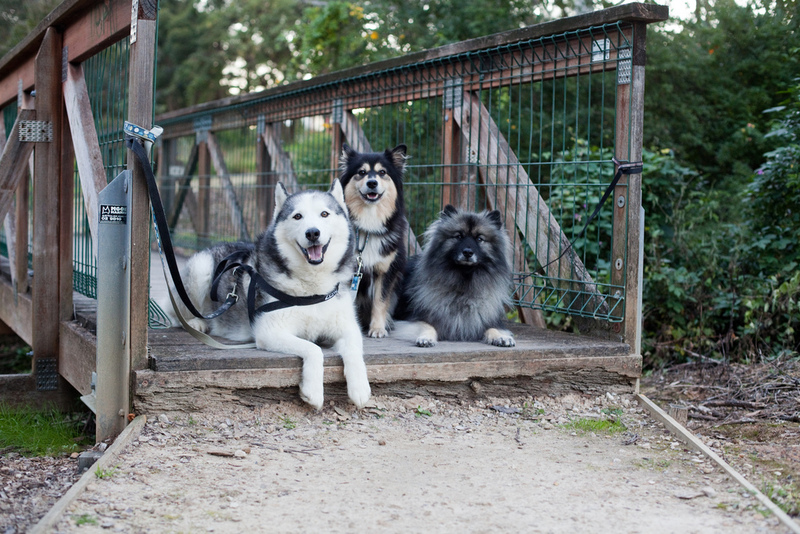 Almost by fate, the same day she phoned one of the Keeshond breeders, their litter had just been born. Two months later, Jedi entered Nik's life and as they say - the rest is history! After meeting in 2008, Nik and Shell attended obedience classes together, progressing through the levels at a steady pace and eventually hitting the advanced and trialling classes. When Nik welcomed Finnish Lapphund, Ahsoka to her family later in 2008, Shell knew she would soon welcome a Lappie of her own too. Finding the right breeder and waiting for a puppy from the lines she wanted however, meant that Veikko would not squiggle her way into her life until 2012. Those 3.5 years however did not go to waste, allowing both Nik and Shell to train and trial in several different sports with Zero, Jedi, Ahsoka and Nik’s not-so-fluffy Kelpie, Revan. We also both found a love for instructing and became qualified obedience instructors, teaching everything from baby puppies to obedience trialling dogs. Unfortunately, due to a change in Nik’s work commitments requiring regular and long periods of work interstate and overseas, she was put in a heartbreaking position where she could not dedicate the time to her beloved dogs. Nik will always be indebted to Shell who took Ahsoka into her family in 2014 and for allowing Soakies to come back home in 2016. She now is loved by both of us and will always be “our” Lapphund. Jedi and Revan continue to live with friends in NSW and are trialling in agility/obedience and flyball respectively. Over the years, we have both dedicated our time to a variety of dog sports including obedience, rally obedience, flyball, agility, herding, tracking, treiball, disc dog, dock diving, lure coursing and conformation showing. While Zero is now enjoying his retirement, the Lappies continue to challenge us to grow as trainers as they continue to develop their skills and achieve success in the trialling ring. In May 2016, Pawformance welcomed the ‘twins’ – Veikko’s son and daughter, Solo and Link, starting another chapter in our passion for all things Lapphund! Dexter, a rescue Kelpie also joined Nik's gang in November 2016, satisfying her need for a little more crazy in her life. Though not considered the easiest dogs to train, we are huge advocates for training with spitz breeds (with the exception of Nik’s obsession with Kelpies!). If you’d like to talk about any of our beautiful breeds, sports, behaviour or training in general, please feel free to get in contact with us! Zero and Ahsoka with the original Pawformance Dog, Jedi.